Inside a Boston T.J. Maxx, women cluster at long metal racks, examining rows of colorful spring blouses with the kind of laser focus normally reserved for professional sports. It’s a nearly irresistible urge on an unseasonably warm afternoon, a classic impulse buy, and the price of many of the blouses, a mere $9.99, couldn’t be better. 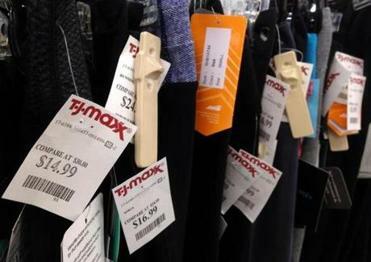 But how does T.J. Maxx sell a shirt for so little, and where does it come from? The answer may not be what shoppers think. You might assume that TJX Cos., the Framingham-based parent company of the T.J. Maxx and Marshalls chains, gets most of its fashions from department store leftovers and specialty store overruns — the model upon which it built its wildly popular empire. The reality, according to its former chief executive, is that as recently as 2011 TJX bought 85 percent of its clothes directly from manufacturers. Whether it’s a brand-name Ralph Lauren polo shirt or an inexpensive printed top from an unknown maker, chances are it never saw the inside of a department store and may have been sent from a distant factory, potentially one with questionable labor practices. TJX said it doesn’t “quantify how much [it buys] from various sources” but acknowledged its current vendor universe is expansive. Analysts and industry experts say that to keep its selection fresh, TJX must rely on goods from no-name factories, overseas and in the United States, including in the Los Angeles garment district. Those factories have come under US Department of Labor scrutiny for underpaying workers who toil in what the agency describes as sweatshop conditions. Officials have said that discount retailers like TJX buy clothes from manufacturers that pay their employees as little as $4 an hour to stitch those must-have blouses. For years, the agency had difficulty connecting those factories to large retailers because they were often managed by subcontractors several steps removed from the big-name chains. More recently, however, the Labor Department has begun going after the retailers themselves. In December, for example, it warned TJX that it must police its manufacturers and end any improper practices, Weil said. TJX has responded by seeking to distance itself from the problems, saying that its vendor code of conduct “expressly requires” that all vendors and subcontractors abide by US labor and wage laws. But the Labor Department’s claims raise questions about the practices that allow TJX to fill its racks at competitive prices, luring shoppers seeking to snap up showroom bargains. T.J. Maxx started out in the late 1970s as a modest offshoot of the now-defunct Zayre chain, specializing in the unflashy business of buying department store castoffs and out-of-season styles at cut-rate prices. As T.J. Maxx grew from its first stores in Worcester and Auburn, acquiring Marshalls in the 1990s, its business model shifted. While T.J. Maxx and Marshalls still offered closeouts, the chain became large and popular enough that manufacturers began producing goods specifically for its stores. Ronald Hess, a marketing professor at William A. Mason School of Business at the College of William and Mary who has studied TJX, said that in the past decade, vendors began to manufacture goods to TJX’s specifications, much as they would for a brand name. If you’ve ever found a Polo shirt in the perfect color at Marshalls, it wasn’t just an overrun. Ralph Lauren and Calvin Klein are the kinds of famous-maker brands that appear to have agreements with TJX, allowing the company to use their designer labels, Hess said. The company has not publicly discussed whether it has licensing deals and declined to comment on the subject. But Hess said the brands are interested in such agreements because of the sheer volume of clothes they can sell through the retailer. Then-TJX chief executive Carol Meyrowitz said in a 2011 interview with USA Today that 85 percent of the stores’ merchandise was purchased directly from manufacturers. Of that, it’s unclear what percentage comes from licensing agreements with established brands like Ralph Lauren because of the company’s refusal to quantify how much it buys from various sources. But sheer size has given TJX and its more than 3,800 stores a huge advantage: They can sell brand-name clothing that is often the exact same product sold in department stores — or close to it — for much less because they are buying so much of it. And in that way, TJX has enchanted not just its legions of devoted shoppers but Wall Street investors. TJX’s sales have nearly doubled in the past decade, to more than $33 billion in revenue this year. By that measure, TJX is selling more clothes than Macy’s, the largest traditional department-store chain in the United States. “Now TJX calls the shots,” Hess said. TJX is famously tightlipped about its strategy, answering questions on the topic by e-mail only. But to stay relevant amid low-priced “fast fashion” retailers that constantly introduce new designs, the company must also secure a flow of inexpensive private label goods, said William D’Arienzo, principal of WDA Brand Marketing & Apparel Analytics in New York. While TJX uses manufacturers from places like China and Vietnam, sometimes that on-trend shirt can be made much closer to home, in a California factory, helping retailers get it to the racks faster. And according to the Labor Department, those downtown US factories are where the problems start. Los Angeles County’s garment district is a sprawling maze of run-down factories, a modern-day haven for mass-produced clothing, stitched fast and cheap and bound for places like T.J. Maxx. They may set up for weeks or months, the Labor Department has said, hiring immigrant workers and paying them by the piece or hourly to stitch garments, often for illegally low pay. “We certainly have found goods destined for T.J. Maxx,” said Weil, the former head of the Labor Department’s enforcement division. Weil, a Boston University economist who will soon become dean of the Heller School for Social Policy and Management at Brandeis University, has spent his career studying workplace pay issues. Here’s how it works, in a nutshell: Garment manufacturers are hired to make certain products, such as shirts and pants for TJX, through a series of middlemen. Sometimes, TJX is multiple steps removed, with the manufacturer hiring a subcontractor, or potentially multiple subcontractors, who then make the products for TJX. The Labor Department has long gone after wage offenders in Los Angeles’s elaborate network of subcontractors, but problems persist because companies shut down, only to reopen under a different name. Many are Korean-owned, the Department of Labor said, represented by the Korean-American Apparel Manufacturers Association, which did not respond to repeated requests for comment. In 2015, labor officials took a different tack, conducting random investigations of factories, interviewing workers, and calculating how many garments they were making per hour, in an effort to link the clothing to retailers such as T.J. Maxx. ■ Ten national retail chains were identified as being linked to factory wage problems in Los Angeles, including T.J. Maxx, Forever 21, and Ross Stores. ■ Investigations at 77 randomly selected Los Angeles garment shops in 2015 and 2016 uncovered violations in 85 percent, and more than $1.3 million in unpaid wages owed to workers. ■ Some workers earned $4 an hour, far less than the federal minimum wage of $7.25, or the California minimum wage, which tops $10. Many of the workers are like J.T. from Guatemala, who said he trimmed shirts in a Los Angeles factory. In an effort to collect back pay, J.T. collected evidence, including a shipping order showing that he was making goods with the Razzle Dazzle label for TJX’s stores in Canada. J.T. declined to disclose his full name because he is an undocumented immigrant, but his story was confirmed by his lawyer. The father of an infant, J.T. worked nearly 70-hour weeks, he said, earning about $6 an hour, sometimes in dimly lit, mouse-infested sewing rooms. At one point, supervisors bought a cat to combat the mice. “The cat would just go to the bathroom all over,” he said. The Labor Department said it identified some retailers who were paying the equivalent of $4 per garment, when they should have been paying $10, had wage rules been followed. It was unclear what TJX has paid. Investigators brought their findings to TJX’s lawyers at company headquarters in December, informing the company it must monitor the factories for compliance with labor laws or face the consequences for knowingly selling goods found to be in violation of the law, Weil said. “Our code also expressly requires our vendors to pay the legally prescribed minimum wage or the prevailing industry wage, whichever is higher, and our vendors must ensure that all subcontractors they use comply with these same requirements,” it said. It is unclear how the Labor Department will proceed under the administration of President Trump. Weil said that when he left, investigators had planned to return to TJX, to ensure compliance. But since the Jan. 20 change in administration, the department’s officials have not responded to multiple requests for information about the status of those efforts.